David Macdonald reports on the poll that names Cecil the Lion as the most influential individual animal and asks what this means for lion conservation. The fascinating ranking of the world’s most influential individual animals, just published by TIME magazine, makes an entertaining read, and will raise a few chuckles: http://time.com/4301509/most-influential-animals/. It also raises some very serious points. First and foremost, of course, the top ranked, most influential animal is Cecil the Lion – the individual that the WildCRU team, led by Dr Andrew Loveridge and myself had been tracking by satellite in Hwange National Park, Zimbabwe, since 2008.I believe that the global attention given to Cecil transcends interest in one, admittedly beautiful and fascinating, lion, or indeed distaste at one illegal hunt: rather, this global reaction, and indeed Cecil’s top ranking in TIME magazine’s survey, reflects a much deeper concern throughout society for lions, indeed for wildlife, and for how humans in the Twenty First century should live alongside Nature – a deeply complicated issue, amongst the biggest facing humanity. However, Cecil’s primacy in the poll suggests to me that this is a question on peoples’ minds, worldwide, and that when I ask: can the Cecil Moment become the Cecil Movement, the answer may be yes. 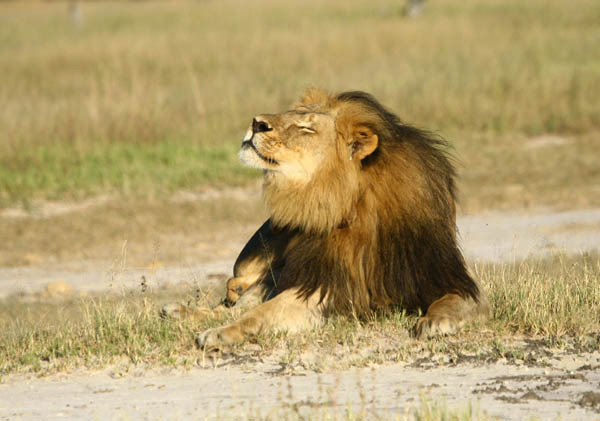 But what is the Cecil Movement to deliver? A first answer could be a reversal in the fearful decline in lion numbers, and indeed conservation of all the other species for which lions can be umbrellas, and for this reversal to happen in conjunction with safeguarding the well-being of human communities that live alongside the top predators. And how is this to be delivered? This, at a technical level is exactly the question that the WildCRU’s work seeks to deliver, a quest supported by those who continue to donate to support us https://www.campaign.ox.ac.uk/wildcru – it requires arduous fieldwork in thorny environments, but it also requires innovative thinking about new approaches to policy, economics, regulation, development and wider geopolitics – at the WildCRU this is our greatest challenge and will be the topic of the brainstorming workshops we plan as this year unfolds. So, Cecil’s top ranking in TIME reminds us that people – not just specialists, but everyday citizens in every walk of life – care about the fate of this lion and thus, I hope, the fate of all lions. And on the topic of what people care about, the TIME list has more revelations. Earlier this year the WildCRU team published a fascinating survey (involving talented market researchers at Touchstone) of which mammals everyday people valued most as conservation priorities. In this paper we showed 1500 people around the world images on screen drawn from a sample of 100 photographs of wild mammal species of every size and shape. Astonishingly, despite the huge diversity of mammals from kangaroos to kinkajous, choices were consistent: from the USA to Australia, the UK to India: everywhere, the tiger came top, overall the lion came third and of the top 10 ranked species, 6 were big cats. Felids swept the board in the public’s minds (and, it seems, in their hearts). What then, of the TIME ranking – they too consider 100 animals (although, unlike us, not 100 different species, and not only mammals). Of course, we know a big cat won: Cecil. Further, a quick tally shows that of 11 wild species selected, five were big cats (and remember, they were selecting not just from 5000 or so mammal species, or 64,000 vertebrate species, but closer to 7 million animal species – they did select, at Number 63, a hauntingly translucent mollusc, an octopus known engagingly as Ghostopuss – and even it has a feline name!). In terms of a triumph for Carnivores, 11 of the 100 photos were of wild carnivores (added to 47 domestic carnivores; by the way 30 domestic dogs trumped 14 domestic cats). What should you make of this? Well the TIME survey has no pretensions to scientific rigour, and we shouldn’t take it, or ourselves, too seriously, but knowing what a wider public finds appealing is very important to conservation – perception is the basis of decisions, and it’s clearly not down to chance alone that we find a lion at the top of this list, with a tiger, mountain lion, cheetah and jaguar following: as ambassadors for wildlife, big cats are hard to beat, and as umbrellas, sheltering all that hops, creeps, crawls and slithers, they have a special place in conservation. The TIME magazine journalist, Joel Stein, concludes that Cecil has revealed a decisive societal turning point – that people, or at least Americans, generally think trophy hunting of wildlife is no longer an appropriate pastime. If so, this is a big conclusion, and one we have also suggested could have largely unknown impacts on conservation. However, there is an even bigger question: how can the conservation of lions, and all they represent, best be achieved? This is the focus of the WildCRU’s team.